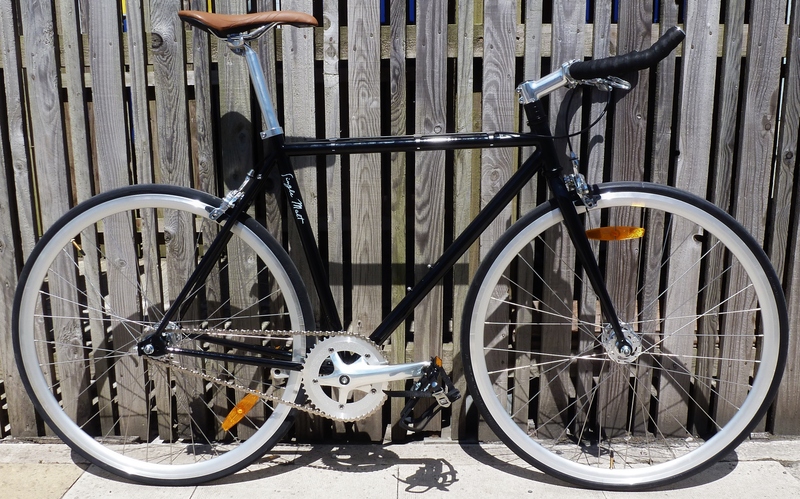 Single Speed Bike ideal for city commutes and urban riding. Few little niggles in that it has rack mounts but, for some reason, no mud guard mounts. If you use a rack then the supplied chain tugs won't fit on (you can get some low profile ones which will). Came with a 16t fixed cog and lockring which weren't greased so recommend you remove and check if you're planning on riding fixed. Chainring was (I think) 42 but that came straight off and I replaced it with a 48 which was still fine with the supplied chain (which is a KMC whose chains I've been using for years with no problem). There is quite a lot of toe overlap (see main picture). Rear hub is a little noisy and supplied tyres are about as cheap as you can get.Depending on how far forward the rear wheel is in the dropouts you might just get a 28c tyre in there - I'm running a 25c which is fine. Considering the price definitely happy overall. Will do the job as a commuter well. With the rear brake and freewheel gone it feels pretty light and the handling seems precise. Brakes and saddle seem decent enough and came with nice Cinelli bar tape. I'm just shy of 6ft and the 56cm seems a decent fit. Would definitely recommend. Fantastic bike at an unbelievably low price. Good build quality and the frame seems nice and light. Virtually no rolling resistance, it glides. I ordered 2 of these bikes for my sons and they are very pleased with them. The bikes are light, responsive to ride with good quality parts, and they look good too.